The BBC has released ( Sept 2006 ) a passionate new version of the much-adored classic Jane Eyre as a four-part serial. It stars Ruth Wilson as Jane Eyre and Toby Stephens as Edward Rochester. Other stars include Francesca Annis as Lady Ingram, Christina Cole as Blanche Ingram, Lorraine Ashbourne as Mrs Fairfax, Pam Ferris as Grace Poole, Tara Fitzgerald as Mrs Reed, Georgie Henley, ( of The Chronicles of Narnia fame ) plays young Jane while Aidan McArdle plays the visionary John Eshton. The drama was filmed exclusively on location in Derbyshire and the Peak District. Jane Eyre is adapted by Sandy Welch (North and South, Magnificent Seven), directed by Susanna White (Bleak House) and the Executive Producer is Phillippa Giles. Charlotte Bronte’s novel was written after a visit she made to North Lees Hall near Hathersage in Derbyshire and many of the book's descriptive passages depict the scenery that still attracts visitors today. 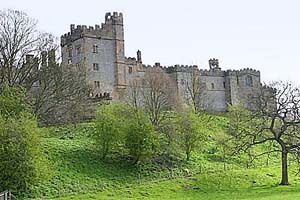 Bolsover Castle:- Lowood Schood where Jane spends her early years. Played here by Georgie Henley with other pupils being played by children from the Ripley Academy, a local drama school. The Riding House at Bolsover Castle was completely transformed for use as a dormitory. Ilam Youth Hostel:- Used as the exterior of Lowood School. 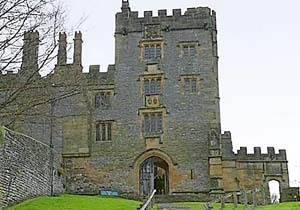 Haddon Hall:- Home of Mr Rochester. The spectacular fire scenes where sophisticated pyrotechnic special effects allowed the Hall to 'burn' through the night resuled in nearly 100 calls to the fire brigade by worried local residents. Wingfield Manor : - Used as the ruined hall after the fire. Hathersage and Stanage Edge were used for moorland scenes. A farmhouse near Stanage was used as the cottage where the Rivers sisters lived. Kedleston Hall:- The Undercroft was used for the Caribbean scenes from Mr Rochester's youth. Dovedale:- Used in first episode where Rochester looms out of the mist on a black stallion and meets Jane for the first time. Red House Stables at Darley Dale provided coach and horse. The scene with the burning bed was shot in a warehouse on an industrial estate near Chesterfield. A National Trust property near Snake Pass was used as the little Parish school where Jane teaches at the end of the story.